Last week I was asked to play violin at a Good Friday service for a church in Amber, Oklahoma. It was a small town located a good 45 minutes out in the middle of nowhere, and it had an even smaller church sitting right in the middle of deserted Main Street. The week before, I'd randomly received a call from the music minister in Amber, saying that he got my name from the music minister at my church and wanted to know if I would be available to play for them. He seemed relieved when I told him that yes, I would be available. He thanked me effusively and said, "I've called four churches so far, and no one has a violinist!" Having lived in Oklahoma now for three and a half years, this was not surprising. It's band all the way down here, and I recently had an epiphany: it's because college sports are such a huge deal, and they want people to play in the band at football games. In Illinois, however, it's quite the opposite. There's band, of course, but orchestra is offered as an elective as early as the fourth grade. That's when I started playing the violin. One day during music class, they brought in all the different instruments and let us try them out. If we were interested, we could come to school early once a week and start learning. Looking back, I'm not sure why I initially picked the violin. 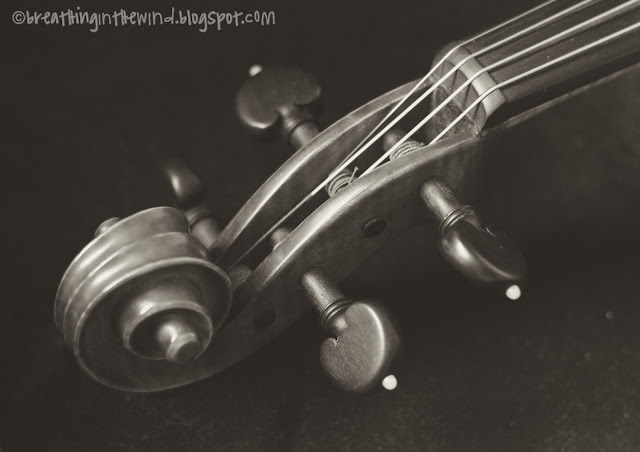 It could have been because I didn't want to carry the bass or cello around, and I think I liked how the violin played higher notes than the viola. I played for the rest of fourth and fifth grades and all though middle school. When I was eleven, it wasn't considered "cool" to be in the orchestra, and I hated carrying the ugly rental case back and forth every day. My parents bought me a violin case in seventh grade, but what I really wanted was a violin of my own. They said they wanted to wait to buy me one until they were sure I would keep playing. I entered high school and signed up for orchestra as my elective, where I became part of a sixty-piece orchestra. For Christmas freshman year, my parents bought me a violin. I started crying when I saw it. To this day it's my most memorable Christmas present. My senior year I made first chair of the second violins, which meant I got to sit in the front row next to my best friends, who, incidentally, sat first chair first violin, first chair viola, and first chair cello. We had good times in the front row avoiding being hit by our conductor's baton or sprayed by his spit. Then I joined my college orchestra. It was much smaller and included members from the community--older men and women who still enjoyed playing. We came together with the choir and played The Messiah every Christmas. I loved it. Every once in a while I would bring my violin to my grandparents' house and play for them. When we went back to Illinois for my grandma's funeral in December, I considered bringing it with me. Just because I knew she would have loved it. (We could barely fit ourselves in the car, though, so the violin stayed at home.) I remember once playing hymns from an old green hymnal my grandma found while my family sang along. When I moved to Oklahoma and found a church I liked, I immediately asked about playing violin on Sundays. They didn't have anyone who played; I was actually the first person who'd ever asked. Since then, I've played almost every single Sunday morning. I've also gotten the chance to teach two people, and I've played in three weddings. This was all flashing through my mind as I drove to Amber last Friday, and I realized that it had been seventeen years since I first held a violin. I'm not trying to sound all poetic about it or anything, but this overwhelming feeling hit me that I am so thankful I started playing all those years ago. I don't know how hard it would be to pick it up later in life, but I do know that they say it's easier when you're young, and I don't know if I would have the patience now to learn. I just love the way the violin sounds. I love that the old people in church come up to me on Sunday mornings and tell me how much they enjoy the music. It's not because I'm so great; I just love that I can use my talents to serve. And on a slightly more selfish level, I love that the hobby that wasn't "cool" in the sixth grade is now something people tell me they wish they could do. If I could, I'd go back to eleven-year-old me and tell myself not to feel stupid for being in the orchestra. "Self," I would say, "don't run past the eight graders in shame." Of course, middle school was a bad time for me anyway, so I don't know if that advice would have helped all that much. But a little self-confidence wouldn't have hurt. I guess what I'm really saying is that I'm glad I didn't quit. I could have, and I think I almost did a few times; I remember hating to practice, and I know I sounded terrible for the first few years. But my ability to play the violin is something I like about myself. It's something I'm good at, something I enjoy. Something I'm grateful to be doing now and something I hope I'll be doing in the future. I'm jealous of your violin skills. I'm glad you didn't give it up...such a pretty instrument! I'm glad you still play too. I don't play as often, so I'm rusty. But I too am proud of the fact that I can (and do) play. 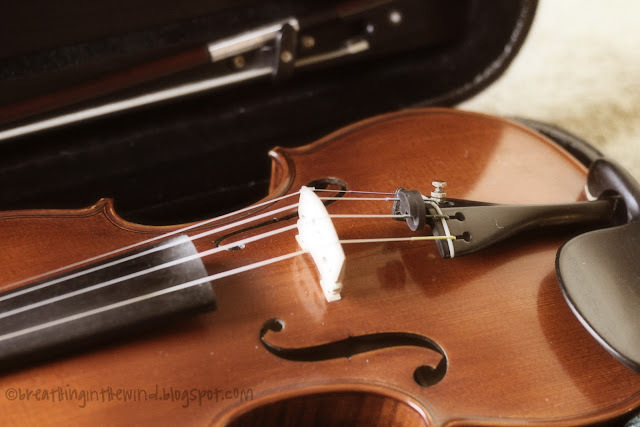 I think the reason I chose violin over the other instruments in school was that I finally wanted to do something different from my brother (who had joined the band the year before), and a violin was the only stringed instrument I had heard of. And I also knew I *could* learn it because I'd already been taking piano lessons for the last year, so I knew the clef. I was in 5th grade. 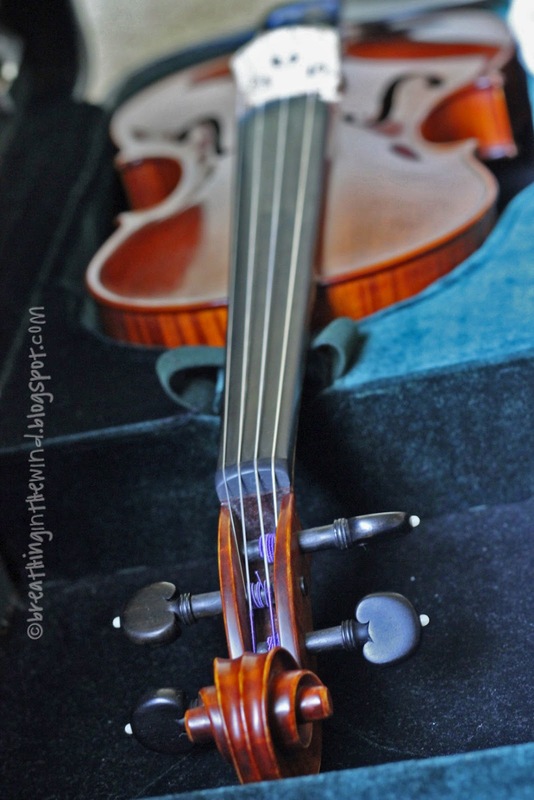 Violins are the most gorgeous instrument. I never played anything - but wished I had. How wonderful. Having piano lessons would definitely help with playing a string instrument, and that makes sense that you would want to do something different from your brother. I'm glad you still play too! You should see about playing in church! Good for you! I wish that I could play the piano, though I quit lessons when I was young. I sure do regret it now! This was so fun to read!!! I'm slightly obsessed with violins and people who play them mostly because I want to learn! I played clarinet way back when and like you totally hated carrying the case around and in middle school I was a loser because I was good at it. I didn't stick with it but don't really regret it because my main instrument has always been the piano and I still can do that fairly well.